Tech Talk – What the LUTs? LUTs LUTs LUTs… That indeed is a word you frequently hear if you are interested in photo editing and image processing these days. I want to demystify this term LUTs and show you how and when they can be useful. LUT is short for a look-up table. Look-up tables are a favorite tool used in computer programming. They are a computationally efficient solution to many problems. Think of them as a spreadsheet. There is a list of input values and corresponding output values. Look-up tables in the image processing world work by taking the RBG values of a given pixel, locate them in the table, then finds the equal output values. Because each pixel has values for Red, Green, and Blue; it’s not a simple flat table but a three-dimensional cube. If you are familiar with the way ICC color profiles work, it is very similar. Photographers are somewhat late for the LUT party. LUTs have been around in video editing applications for years. In fact, LUTs are so prevalent in video editing that they have almost become a universal preset if you will, that’s used across different applications. LUTs commonly come in the .CUBE and .3DL formats, making them easy to interchange across applications. What can a LUT do? LUTs are great for certain photo editing adjustments, but can’t do others. Let me explain where they are useful and not. LUTs are helpful for making the same kinds of adjustments you would with a curves dialog in your photo editor. They can make global changes to color and tone. This means they are good at creating vintage, cinematic and matte looks, some black and white looks as well as split toning. However, they are not image content aware, so they can’t do a good job at things like adjusting highlights and shadows. They also can’t do things like sharpening, blurring, noise reduction, etc. Where can I use LUTs? In the upcoming release of ON1 Photo RAW 2018.5, you can use LUTs in the new LUTs filter in Effects. The filter gives you a few useful controls like contrast and saturation that are handy when working with a LUT. More importantly, they apply like any other filter in Effects. You can control the order in your processing in which you apply them to your photo. You can adjust the opacity and blending mode as well as use any of the masking tools to apply them just where you want. LUTs are also used in common photo editing applications like Adobe® Photoshop® as well as other photo editors. 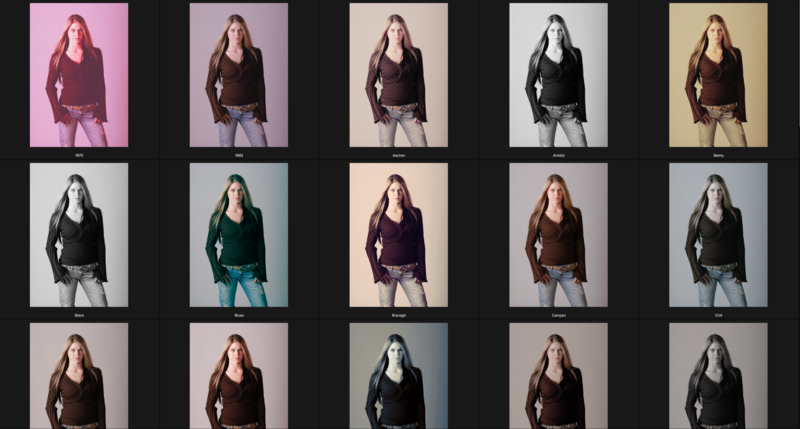 LUTs are also in Adobe Lightroom®, but they need to be converted into a unique format first. How do I get LUTs? Well, if you use ON1 Photo RAW 2018.5, there are a ton built-in. Plus you can easily install LUTs in the standard formats just like you would a texture or a border. There are more LUTs you can download for free from the ON1 website too (coming soon). Plus online there are millions of free or commercially available LUTs that are compatible with ON1 Photo RAW 2018.5. LUTs offer another tool in your image editing arsenal. Now you can take advantage of all the great LUTs available online for recreating cinematic, and vintage looks on your photos quickly.